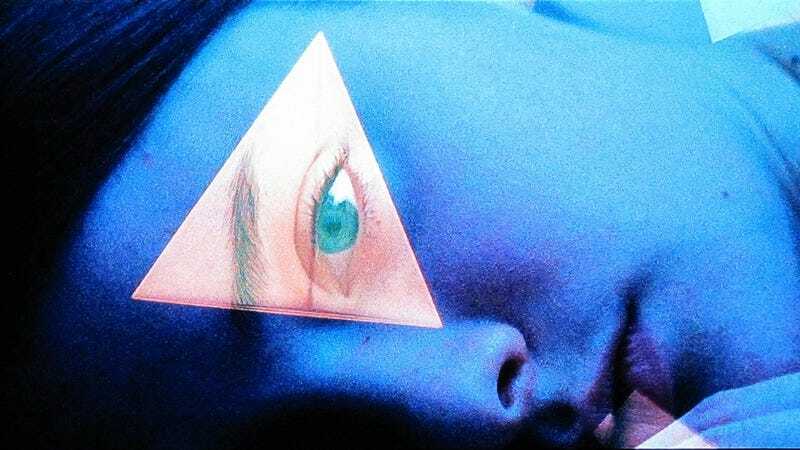 Combining elements of 2001: A Space Odyssey, THX 1138, and the works of John Carpenter, albeit filtered through a surrealistic avant-garde lens, Beyond The Black Rainbow stands as the most strikingly original and unsettling genre film of this decade. Written and directed by Panos Cosmatos (the son of Rambo: First Blood Part II, Cobra, and Tombstone creator George P. Cosmatos), this science-fiction saga is a legitimate mind-bender with a story only understood through constant, rigorous focus on—and interpretation of—its oblique plot details and attendant, insane imagery. Nonetheless, comprehension is possible, even amidst Cosmatos’ flurry of ominous not-of-this-world sights. Married to a haunting synthesizer score, the mad imagery includes a towering figure in a crimson bodysuit and helmet, empty white rooms featuring glowing-light buttons, inscrutable diagrams and drawings of monstrous things gestating in human bodies, and—central to all of the action—a gigantic glowing white prism. That mysterious object is housed in the Arboria Institute, where, in 1983, the unnaturally calm, incessantly grimacing Dr. Barry Nyle (Michael Rogers) carries on his predecessor’s work—which mainly involves studying a young woman named Elena (Eva Allan) whose psychic powers are suppressed by both heavy sedation and the influence of the prism. In therapy sessions Nyle has with the mute Elena from behind a glass partition, it becomes clear that the twisted doctor desires her. The root of his obsession, however, isn’t fully realized until a terrifyingly bonkers flashback to 1966 (shot in blooming whites and murky blacks). The ensuing horrors dispensed by Beyond The Black Rainbow are of a dreamlike, psychosexual nature, up until a pseudo-slasher-film finale in which Nyle, seeking to stop Elena from escaping her confinement, wields a dagger known as “The Devil’s Teardrop” and discards his outward disguise to expose himself, finally, as a force of uncanny, unholy evil. Availability: Beyond the Black Rainbow is available on Blu-ray and DVD, which can be obtained from Netflix or your local video store/library, and to rent or purchase through the major digital services. It’s also currently streaming on Netflix.